Market-setting sports books 5Dimes and Pinnacle opened with BYU listed as an 8-point favorite, while the total was set at 59 points. The Cougars have since received close to 66 percent of tickets forcing the shops offshore and in Vegas to make them a 10-point favorite while the total has dropped to 57 points despite approximately 85 percent of the wagers backing the over. Get more free college football predictions from our expert handicappers. The Cougars closed out the regular season by winning four straight and seven of their last eight (5-3 ATS). 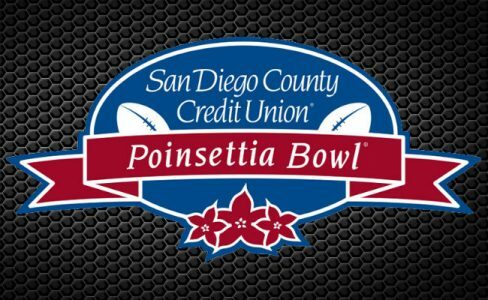 They’ve held each of their last four opponents to 10 points or fewer and come into the Poinsettia Bowl game ranked 32nd in total yards allowed, 100th against the pass, 8th against the run and 15th in points allowed, surrendering just 19.4 points per game. This will be the Cougars 12th straight bowl, but they’ve not won one since a 23-6 victory over San Diego State in the 2012 Poinsettia Bowl. BYU will have to do without starting quarterback Taysom Hill who suffered a season-ending injury in a 28-10 win against Utah State on Nov. 26. Sophomore sophomore Tanner Mangum will take his place, and he completed 59.9 percent of his passes for 3,377 yards with 23 touchdowns and 10 interceptions as a freshman while replacing Hill when he missed virtually all of last season with a fractured foot. BYU senior running back Jamaal Williams rushed for 1,165 and 11 TDs despite missing three of the last five games with an ankle injury, but figures to be healthy again after rushing for 131 and a score on 18 carries in the last game of the regular season. The Cougars are 8-3 ATS in their last 11 non-conference games while the under is 6-1 in their last seven games overall. The Cowboys have dropped three of their last four games outright while going 2-2 against the spread. They lost 27-24 to San Diego State in the MWC Title game on Dec. 3, despite holding the opposing QB Christian Chapman to just 6-of-13 passing for 85 yards. They did however struggle to stop the run giving up 242 yards on the ground. They’ve allowed 34.8 points per game over the course of the season and rank 112th in total yards allowed, 106th against the pass and 88th against the run. Wyoming has a solid quarterback in Josh Allen who has thrown for 2,996 yards and 26 touchdowns this season, but he’s also been picked off 13 times. The star of their offense is junior running back Brian Hill whose 1767 yards rushing this year is 4th in the nation. It will however not be easy for him to put up big numbers here against a solid Cougar run defense. The Cowboys are 7-2 ATS in their last nine games overall while the over is 4-1 in their last five. Advantage BYU on both sides of the ball and the Cougars will be determined to finally win a Bowl game again. The Cowboys have had a great season under MWC Coach of the Year Craig Bohl, but they’ll come up short here.